A picnic table, or picnic bench, is a modified table with built-in benches on both sides. The picnic table's main purpose is for eating meals outdoors. While it's not documented when the first picnic table was used, legend has it as early as the late 1800s. They were used in public gathering places throughout small towns. Originally, all picnic tables were made of cedar, pine, and other hardwoods. Over time, both the residential picnic table and commercial picnic table have been constructed from commercial-grade plastic, PVC, steel, aluminum, recycled materials and plastic coated metal. A common picnic table can be constructed using 2' × 4' or 2' × 6' hardwood and standard stud size. To make picnic tables last over time, wood sealers, stain, or traditional paint have been used before or after construction is completed. Since most hardwood will crack, warp or rot, protecting the wood is paramount to extending the useful life of the picnic table. Traditionally, picnic tables have a simple construction plan: the table-top and bench-top boards are attached to the trusses or beams using rust-proof wood screws or galvanized nails. The legs are typically secured by using commercial grade carriage bolts fastened by nuts and washers. This helps make the overall frame of the table stable and solid so that it will stand up to heavy outdoor usage. 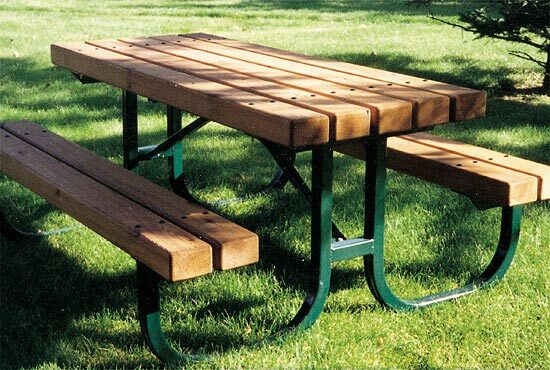 We carry only the top manufactured commercial picnic tables that are proudly Made in the USA! We are so confident that you will be pleased with both the quality and construction, that all are backed with a five-year warranty!